"You can transform people… That's very powerful." Broad Green Pictures + Amazon Studios have released an official US trailer for Jocelyn Moorhouse's The Dressmaker, starring Kate Winslet as a "glamorous woman" who returns to her small hometown in rural Australia. We actually featured the first trailer for this film over a year ago, last summer, since it was released in Australia back then. It's just now getting a US release this fall, for anyone still interested in giving it a look. Liam Hemsworth also stars as the young guy she falls for in town, with a cast including Judy Davis, Hugo Weaving, Caroline Goodall, Shane Bourne and Kerry Fox. This almost seems like a dusty, down under version of The Devil Wears Prada. 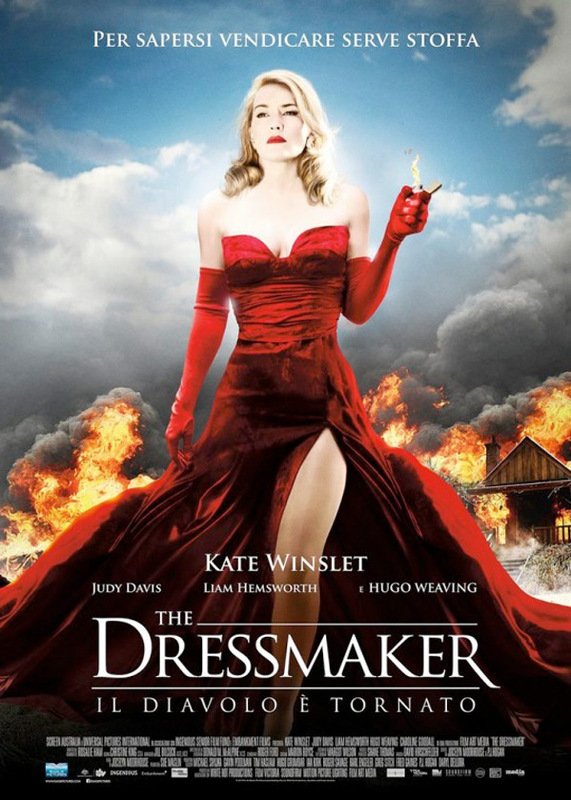 Based on the best-selling novel by Rosalie Ham, The Dressmaker is a bittersweet, comedy-drama set in early 1950s Australia. Tilly Dunnage (Winslet), a beautiful and talented misfit, after many years working as a dressmaker in exclusive Parisian fashion houses, returns home to the tiny middle-of-nowhere town of Dungatar to right the wrongs of the past. Not only does she reconcile with her ailing, eccentric mother Molly (Davis) and unexpectedly falls in love with the pure-hearted Teddy (Hemsworth), but armed with her sewing machine and incredible sense of style, she transforms the women of the town and in doing so gets sweet revenge on those who did her wrong. The Dressmaker is directed by Jocelyn Moorhouse, from a script by Moorhouse & P.J. Hogan. Broad Green will open The Dressmaker in theaters September 23rd. Looks quite good despite having the box office poison known as Liam Hemsworth in it. Looks kind of fun, like every guy's secret love of THE DEVIL WEARS PRADA.